What Is the Average Medical Sales Salary? 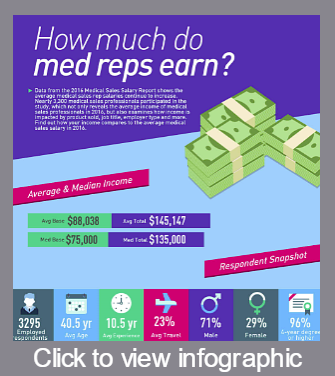 How much money do med reps earn? This is the question that spurred the first MedReps Salary Survey back in 2011. According to the most recent findings, in 2016, the average medical sales rep salary is $145,147, with an average base of $88,038. However, if you’re working in medical sales jobs, you know that income can fluctuate significantly, and this report examines exactly how and why. 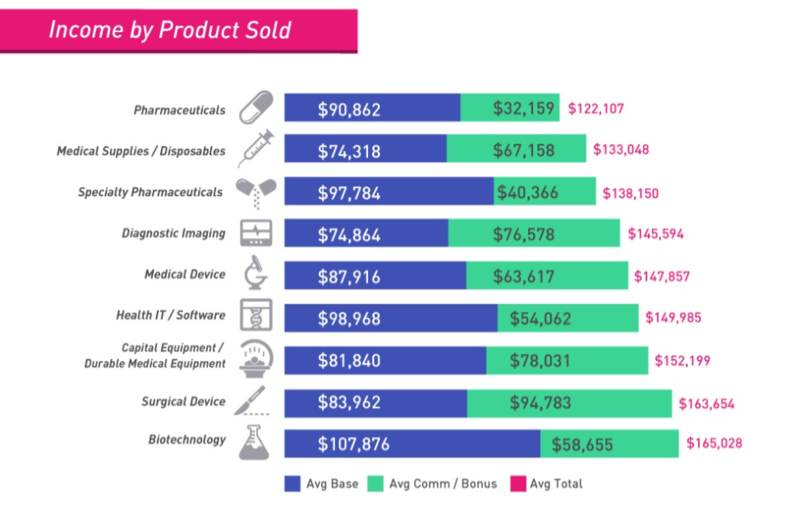 The 2016 Medical Sales Salary Report looks at how medical sales rep salaries are impacted by key factors such as the type of product sold, the market for that product, and the type and size of employer. 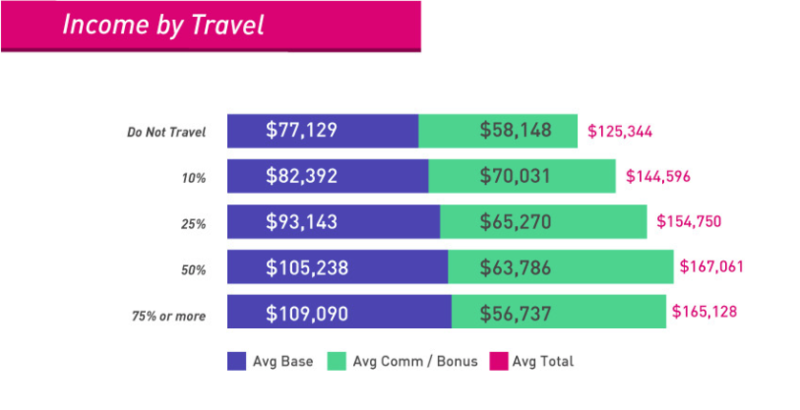 How much professionals travel, their job titles, and where they live are also considered. Even seemingly unrelated factors such as age, gender, and education levels are studied. An incredible 4,000 medical sales professionals participated in this year’s salary survey, however, only respondents who are currently employed in medical sales jobs were counted. This brought the total number of respondents to a record-breaking 3,295. As has been the case in previous years, the majority of respondents work for manufacturers (70%) in a field sales role (71%). A third of respondents sell medical (9%) or surgical devices (25%), and one quarter sell pharma (15%) or specialty pharma (9%). In addition to noting the average medical sales salary in various categories, the report occasionally notes median incomes as well. Average incomes may be skewed by a few extraordinarily high or low answers, so the median often more accurately reflects the income of the majority. Medical sales jobs encompass so much more than simply pharma and device. Professionals selling medical supplies and disposables, capital equipment and DME, even health IT products and services all fall under the umbrella of medical sales. Product is a key factor in determining medical sales rep salary. In fact, which product you sell may be the most significant factor impacting how much you earn. So who earns the most? In 2016, biotech sales professionals claimed the top spot, earning $165,028 (Median $155,000) in total compensation. Surgical sales professionals were a very close second earning $163,654 (Median $155,000). This year’s report also examines how the specific market a professional sells to impacts earnings. Respondents selling to hospitals, and specifically surgery/OR, earn the highest medical sales rep salary. Home health and rehab markets fell on the lower end of the spectrum. Sales Directors and Sales VPs once again report the highest salaries in medical sales (Average $209,082 Median $205,000). Sales management jobs edged out National Accounts this year for the second place spot with $186,423 total income. 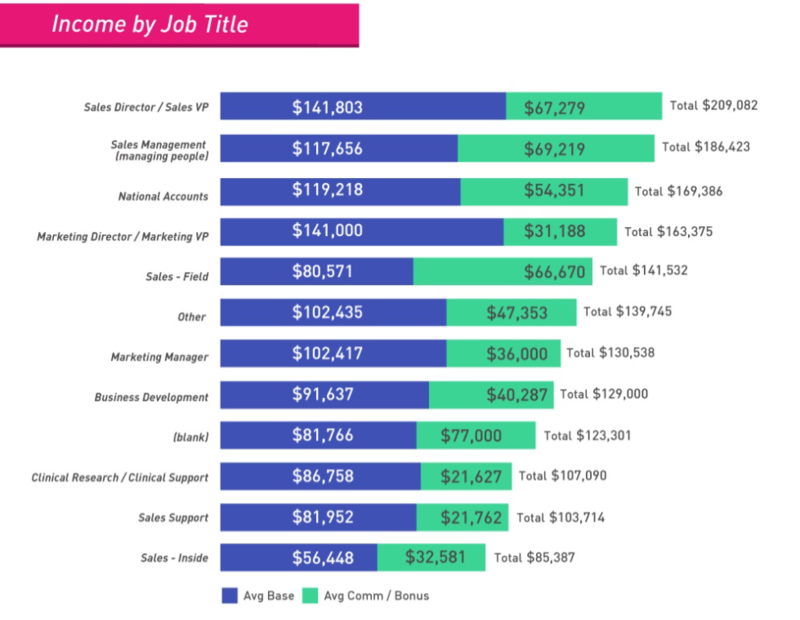 The bulk of respondents (71%) have field sales jobs, which command a not too shabby $141,532 in total income. The bigger money seems to lie in management though. They type and size of the employing company also impacts average medical sales salary. Large manufacturers pay the most at $157,793, but those who are employed by manufacturers, no matter what the size, earn the highest incomes. 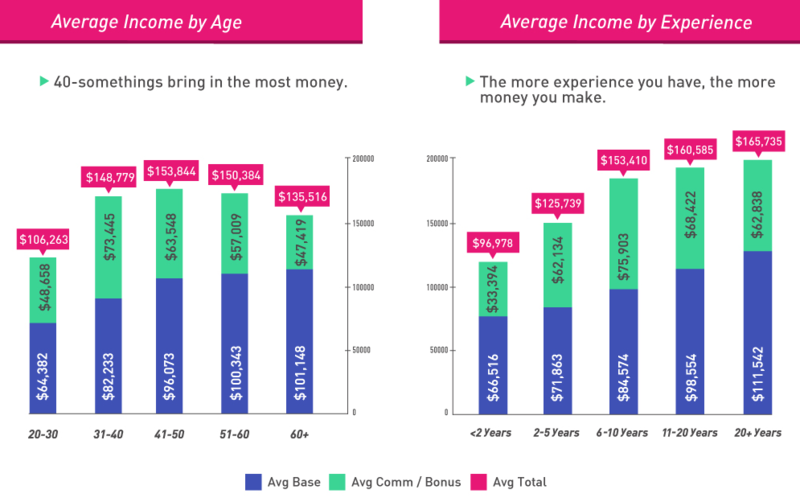 How Do Age and Experience Impact Medical Sales Salary? It’s not surprising that the longer you work in medical sales, the more money you should earn. The numbers on medical sales salary by years of experience confirm this to be true. Those with 20+ years of experience earn the highest average medical sales salary at $165,735. However, if based on that, you’d guess the oldest professionals earn the most overall, you’d be wrong. Medical sales professionals in their 40s earn the highest incomes at $153,844. This seems to be a sweet spot for medical sales professionals where they may have 20+ years of experience, but haven’t yet gotten to a point where age discrimination is negatively impacting them. Men continue to dominate the medical sales industry, with 71% of respondents identifying themselves as male. Not only are women outnumbered in the medical sales workforce, but they are being out earned. Women report average incomes of $123,910, which is just 80% of what men earn. Base salaries are slightly more on par, at $82,863, women earn 92% of the average base salary reported by men. The gap is partially explained by the fact that women are more likely to work in pharma, which typically pays higher base salaries (and lower commissions). Women are also less likely to report having higher paying job titles such as Sales Management or Sales Director / VP. 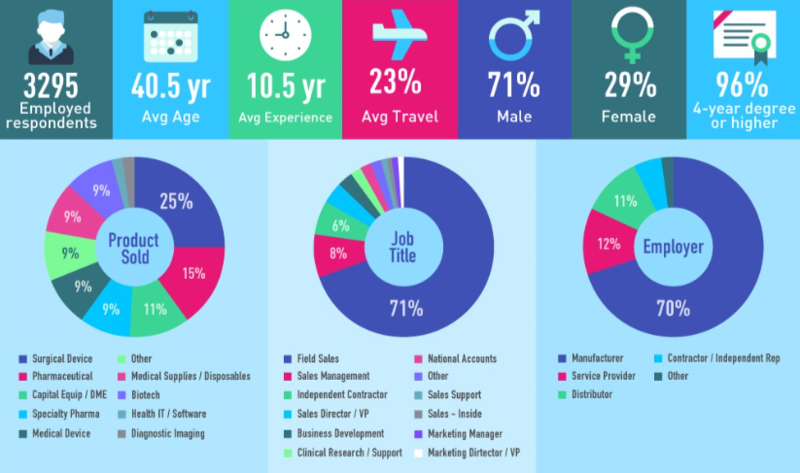 Women make up just 14% of respondents with these job titles. If the amount of diversity among the survey respondents is a fair indication, the field of medical sales is sorely lacking in this area. A surprising 87% of respondents identified themselves as white. Those identifying themselves as Hispanic and African American accounted for just 3.9% and 3.8%, respectively. When looking at income by race, the significantly reduced sample sizes in every category but “white” brought into question the statistical validity of our data. However, any gap that does exist between the average income reported by respondents identifying as white and those identifying as African American may be due, in part, to the fact that African Americans are less likely to hold the highest paying job titles of Manager, Director, and VP. Just 2.1% of these job titles are held by respondents identifying as Black or African American. The majority of respondents have at least a bachelor’s degree, and this is a key factor on income. Respondents with a 2-year degree earn just 74% of that earned by their peers with a 4-year degree (who made up 78% of respondents). The survey results indicate that a Master’s degree (held by 18% of respondents) does increase earnings, but only by 4%. Oddly enough, those with a Doctoral degree actually earned slightly less than those with a 4-year degree, though the number of respondents in this category (<1%) was not high enough to be statistically significant. Where medical sales professionals live does not seem to have a significant impact on earnings. While some states came in notably higher than the rest, they typically had too few respondents to be statistically significant. For example, the state reporting highest average income was Kentucky at $172,471, but the figure is based on only 34 respondents from this state – fewer than 1% of the total respondents. 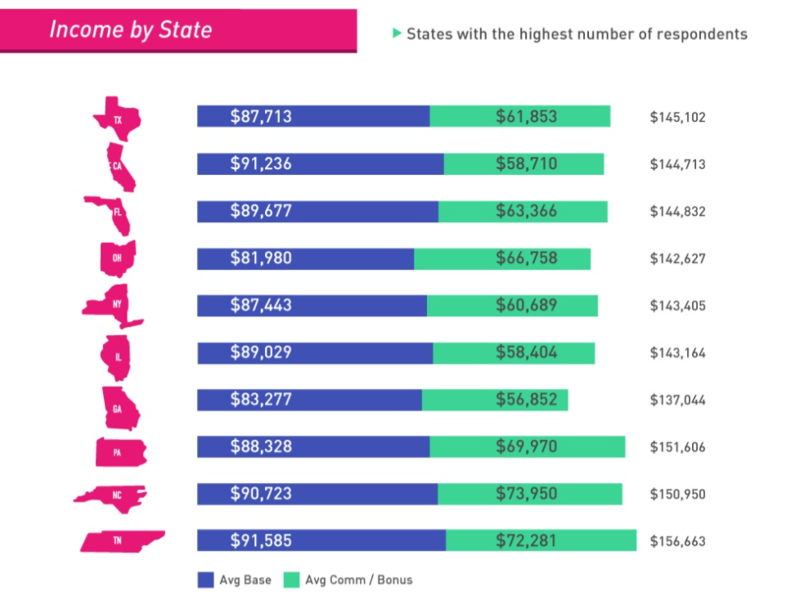 The states with the highest number of respondents are listed here along with the average incomes reported there. 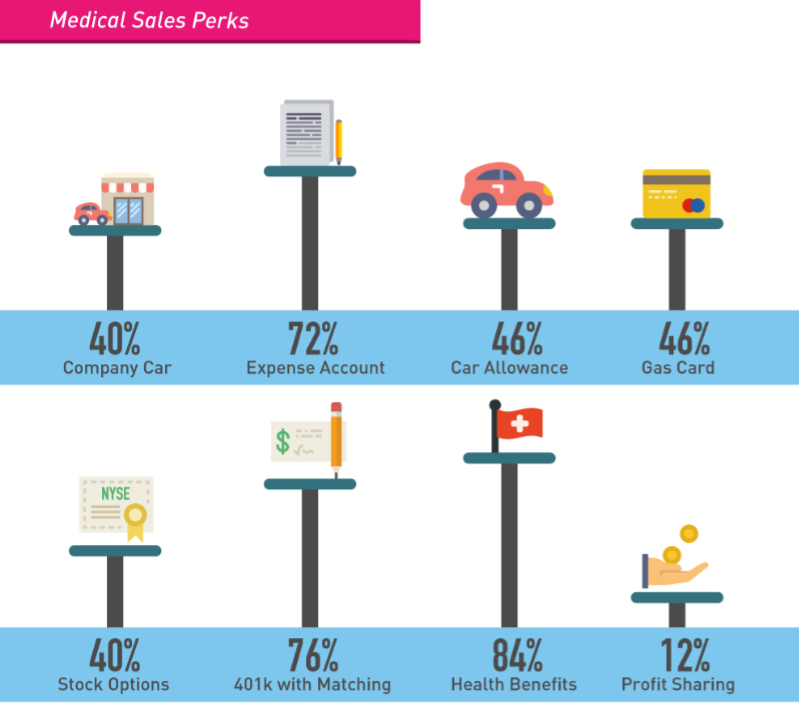 The benefits of medical sales jobs are well known – company cars, expense accounts and more. The 2016 survey found these benefits to be fairly consistent with previous years. Of course money and perks aren’t everything, but income satisfaction does correlate with job satisfaction. More than three-quarters of respondents (78%) reported being very or somewhat satisfied with their overall job, which was similar to the 75% who reported being very or somewhat satisfied with their income. Those who said they are very satisfied with their incomes earn an average of $177,319,while those who said they are very unsatisfied earn an average of $100,903. The overall average medical sales rep salary is up 2.5% from the 2015 average. However, average base salary is up by 8.5%. Median base salary stayed the same though at $75,000, while overall median rose to $135,000. At the individual level, more than half of respondents reported receiving a pay increase in the previous year. Those who received the increase as a result of a job change reported an average increase of 13% while those receiving the increase due to a promotion reported an increase of 9%. The overall average increase (including those who received routine increases) was 6.4%. It’s an exciting time to work in medical sales. The job is not an easy one, but the rewards are great. With an average total medical sales salary of $145,147, the earning potential in medical sales is higher than ever. The 2016 Medical Sales Salary Report confirms that income can vary significantly based on a number of factors – some that can be controlled and some that cannot.